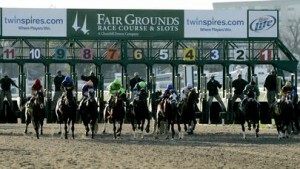 On Saturday, June 21 a highly competitive race for up and coming 3-year-old horses can be found at the Fair Grounds in New Orleans. The LeComte Stakes (G3) run at one mile and 70 yards on the dirt is a chance for these talented sophomores to earn some graded stakes money and for their connections to find out if they have what it takes to work towards the Triple Crown. The $175,000 purse (recently raised from $100,000) has lured no less than 13 starters who all have a good chance to win or hit the board. Horses who run well in the LeComte can look forward to the $300,000 Risen Star Stakes (G2) on February 25, and if they have the talent the $1 million Louisiana Derby on April 1. Other options for horses exiting the LeComte are stakes at Tampa Bay Downs and Oaklawn Park – both good places for Derby prospects to show their stuff. The following is a quick glance at some of the horses likely to attract attention and money on race day. This horse, bred in Oklahoma is coming off a six-race win streak including his most recent win in the $300,000 Springboard Mile. While some of those races were only won by a neck Ted’s Folly won’t fold in the stretch run. He has yet to run at over 1 mile, but the extra 70 yards don’t look like too much o a hurdle for this talented horse. Won at this distance in October at Delaware Park in the Dover Stakes, and then came back to hit the board in the Iroquois (G3) at Churchill Downs. Mr. Bowling is trained by Larry Jones, who won the LeComte with 2nd place Derby finisher Hard Spun in 2007 and Friesian Fire in 2009. Mr. Bowling broke his maiden in a field of 12 so handling this crowd should be a task he can handle. Also, his last three works have been bullet or near bullet moves – another encouraging sign. Exfactor is come into the LeComte with three straight win under his belt including a win in the Bashford Manor Stakes (G3) at Churchill Downs. The main question for Exfactor, who seems to be a very capable colt is the distance. At one mile and 70 yards, the LeComte will be his first start over six fulongs. Beat out Mr. Bowling for the place position in the Iroquois (G3) at Churchill Downs by nearly 4 lengths, but disappointed in the Delta Jackpot finishing 4th eight lengths off the leader. Another warning sign is that Seven Lively Sins only has one win over the Poly at Keeneland and has not yet proven himself on dirt. Consider others if his price is too short. Shared Property is the only horse in the field that has Grade 1 experience even if it was in a sixth place finish in the Breeders’ Futurity (G1) at Keeneland. However, the cut back in distance here represents and opportunity for him to redeem himself. Though Shared Property is breaking from the far outside post #13 he has won in fields of 12 and 13 at Ellis Park and Arlington. Trainer Tom Amos is having a great season at Fair Grounds with 24% winners from 71 starts – so don’t leave this one off your tickets. The LeComte Stakes will go off as the 11th race on the card at the Fairgrounds with an approximate post time of 4:55pm. Winning Ponies will be providing full coverage of every race at Fair Grounds on Saturday in addition to other great tracks around the US and Canada.